Established in 1923, Texas Tech University is located in Lubbock, TX and has an enrollment of 36,000 students. The university offers degrees in more than 150 courses of study through 13 colleges and hosts 60 research centers and institutes. Texas Tech implemented Laserfiche in order to streamline operations and reduce paper. As part of their paperless mission, the General Services department at the Texas Tech University Health Sciences Center (TTUHSC) operates the centralized scanning bureau for the university. 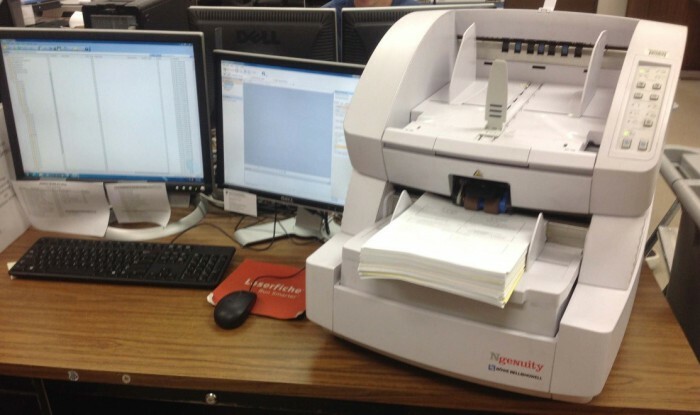 In an average year, one employee and 12 student workers scan two million pages into Laserfiche. Here are the department’s strategies for managing change, scanning and importing huge batches of documents into Laserfiche. The first step in going paperless and implementing new technology is getting buy-in from a major department. An effective implementation of Laserfiche in a major department can serve as a successful example of how it can improve records management and workflow in other departments. In the case of Texas Tech, the Finance and Administration department volunteered to serve as the trial case. Since nearly every department needs to view purchase orders, Laserfiche WebLink gave every employee of the university access. This helped significantly in getting other departments interested in scanning their documents. Involve the staff in the whole project by discussing what records they retrieve most often and how they handle documents. Ask a lot of “why” questions. Work with the staff to decide on the fields to be included in the document templates and to set up the folder structure. Create templates that employees can easily work with without knowing the repository folder structure. Make sure to only include fields that are used for retrieving documents in the template. Too many fields can be overwhelming to new users. Ask employees if there are any databases that contain some of the template information, such as employee information. Laserfiche Quick Fields can look up information from the database and populate certain fields, reducing manual data entry. Create an easy-to-navigate and user-friendly system to show employees how quickly they can find documents. If employees can’t retrieve what they need quickly, they won’t use it. In discussions with departmental staff, focus on how a new system will make them more productive. Sometimes employees think that new technology will make them lose their jobs, so having a transparent discussion of workplace efficiency will alleviate the worry. Once initial resistance is overcome, it is time to scan in a sample of the project. The sample should be a size between one and two percent of the entire project. Once the sample is scanned in, sit down with employees and show them how to retrieve the documents by searching. 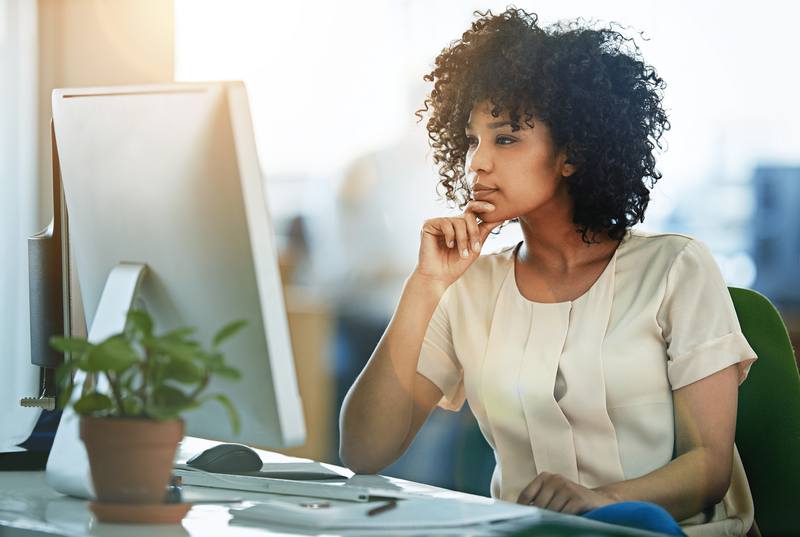 Demonstrate different but common scenarios employees might face when managing documents and how Laserfiche can address these issues. Make sure that the employees are impressed with the ease of finding documents. Once they are comfortable with Laserfiche, give them a two-week trial period to use and work with the sample. Afterward, gather feedback and make sure that the system is set up in accordance with the department’s needs. If a lot of modifications are needed, implement another trial period. It is better to make changes on a small sample than the entire library of a department’s documents. All of these tasks are performed by student workers supervised by one full-time employee. Most of the paper that needs to be scanned arrives at the bureau in boxes. A typical scanning job consists of approximately 30 boxes. As part of the prepping task, color labels are attached to each box and designated job and box numbers are written on each label. Each job has a different colored label to distinguish it easily. Before prepping a box a student worker writes his name on the colored label. 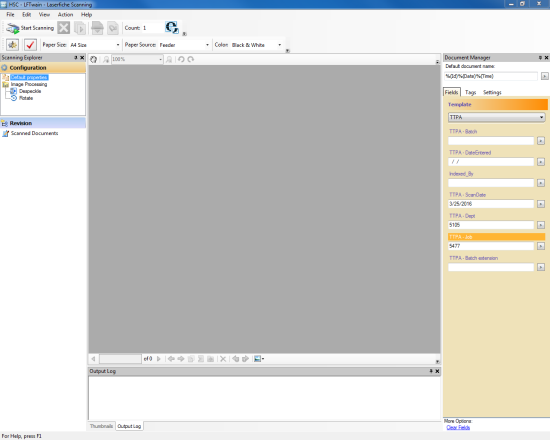 The required folder structure is created in Laserfiche. Folders are created for each job number with each folder containing a separate folder corresponding to each box. 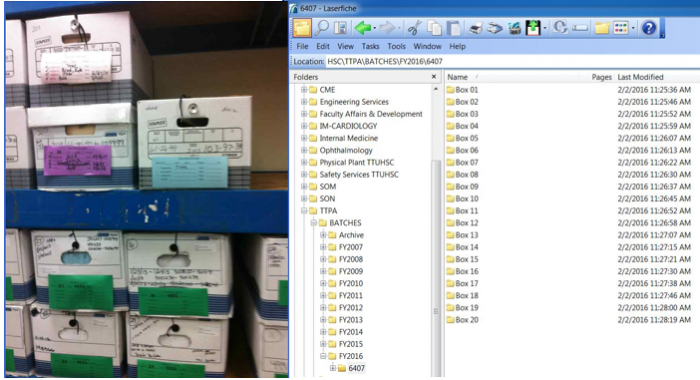 The repository folder structure corresponds to the boxes in which records were originally stored. The student worker prepares the individual documents for scanning by removing staples, binder clips and paper clips. He then binds a stack of 100-150 pages with a rubber band. When a box is completed it typically contains between eight and ten bound stacks. Once the documents are prepped, they are scanned by another student worker. The student scans one individual paper bundle at a time. Each bundle becomes one large document in Laserfiche. During the scanning process, the student verifies that the images are scanned and readable. Virtual ReScan (VRS) automatically ensures color background removal, deskew, despeckle, line removal, and blank page deletion. Once the stacks of paper have been scanned, another student worker performs indexing. The student performing the indexing has the physical document in front of her and the electronic document on the screen. 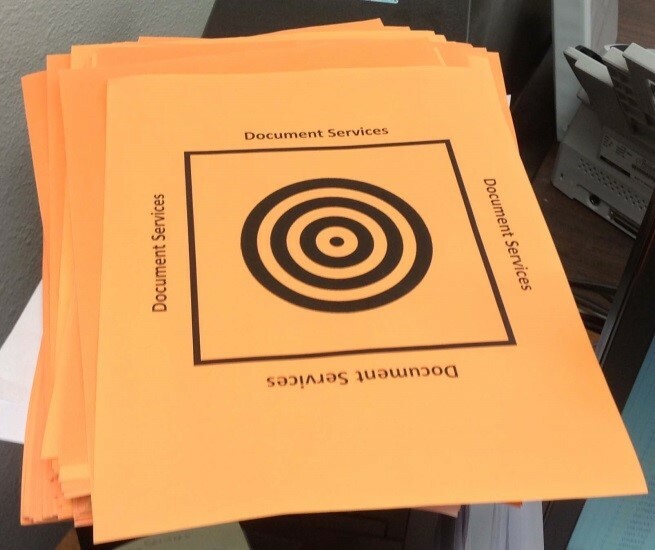 Each physical document is separated by a colored coversheet so that the student knows where each document begins and ends. Divides the document at each separator sheet from the large scanned batch document in Laserfiche. Separator sheets are reused. Checks image quality and verifies that the number of pages scanned is correct and, if a page has errors or is missing, rescans the page into the document using a small desktop scanner. Saves as a new document. The final step is QA. The student worker responsible for this aspect of the process writes his name on the colored box label before beginning. He takes a random sample of documents from the box and looks them up in Laserfiche to make sure that they have been scanned correctly. After the student checks the document sample, he OCRs all documents in that folder. They are then moved and billed by the supervisor. Departments may find new uses for Laserfiche. There may be new legislated mandates that the department must adhere to. A departmental business process might change or a current process may become obsolete. There are new technology advances or new Laserfiche features. It is important to periodically re-evaluate the Laserfiche implementation to take into account any of the changes listed above. Continue to work with departments after the initial scanning project has been completed to make sure that the Laserfiche system continues to meet their needs. For example, some departments at Texas Tech have embraced Laserfiche Forms and have started importing documents internally rather than using the scanning bureau. 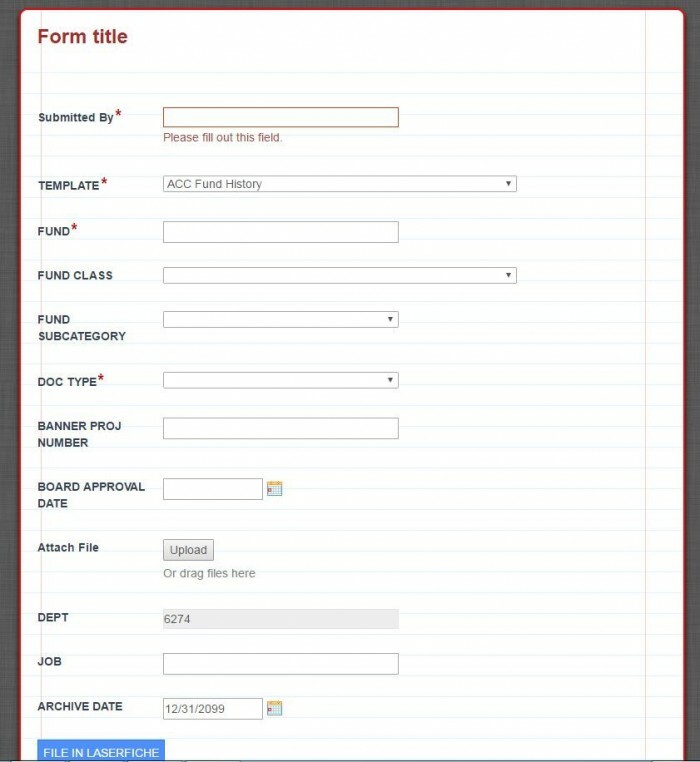 The Accounting department has several forms, including this example of an ACC Fund History form. This form is used each time documentation is uploaded relating to the various accounts being used within the institution. Different types of funds, such as service department revenue, state grants, federal grants and appropriated state funds have required documentation that needs to be maintained throughout the duration of the fund’s use. The person filling out the form selects the appropriate document template based upon whether the documentation uploaded is transactional or historical. In this case, the template selected is the ACC Fund History template. When the name of the template is selected, appropriate fields appear for the user to fill out. Currently, the form allows for only two templates to be selected. If another template must be used, Laserfiche Forms emails an administrator who will either add new template data to the form or revise the submission. Once the form is submitted, the form is saved in the correct Laserfiche repository and properly indexed with the designated fields. The accounting department doesn’t have to prepare coversheets and attach them to documents before having the batch sent in for scanning and indexing. Now it takes approximately the same amount of time to scan and upload the documents that it took to prepare the cover sheet and batch the documents. Each document is immediately accessible in Laserfiche. Since the accounting department scans their own records, they have become significantly more familiar with retention rules and have revised procedures to ensure that they are in full compliance with all applicable laws. Get started managing your organization’s content with this free step-by-step guide: How to Improve Document Storage & Imaging Across Your Organization.